What racquet does Aussie bad-boy Nick Kyrgios play with? He endorses the Yonex Ezone DR 98 but plays with a Yonex Ezone XI 98. 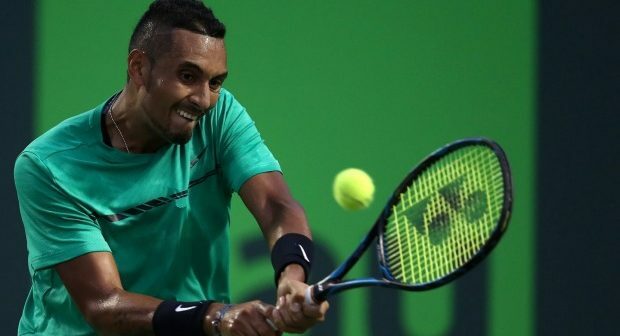 Tennis bad-boy Nick Kyrgios has been in the news recently due to his odd behaviour during his Shanghai Masters match against Mischa Zverev, where he pretty evidently tanked through large parts of his loss. He first received a 16,500 USD fine for failing to give a full effort, unsportsmanlike conduct and verbal abuse of a spectator. But the ATP wasn’t done with him and a few days later he was handed an extra 25 000 USD fine and a suspension lasting through January 15 next year, UNLESS he “enters a plan of care under the direction of a sports psychologist or equivalent, approved by the ATP.” Then the suspension would be reduced to three weeks and he would be able to return to the ATP tour on November 7. Since there are not many tournaments left in the ATP calendar year, it’s safe to say, no matter what, you won’t see Kyrgios on a tournament court in 2016. Will this serve as a strong push for him to move into the right direction? Well, let’s hope so. Kyrgios has one of the most exciting and audience-warming games in the sport today and I think tennis as a sport really needs him to move past his demons and become a professional. He’s only 21 so we know there’s time, but he really needs to sort out some immaturity issues pronto to make sure he can become a force on the tour. One alarming thing in the case of Kyrgios is that he seems to prefer basketball as a sport over tennis and has several times alluded to that his love for tennis isn’t that strong. Maybe his lack of true affection for his profession makes it harder for him to respect the sport, the audience and his opponents? No matter what, I personally hope to see him back soon with a new mindset, a willingness to improve his mental approach and a desire to become the best tennis player in the world. But this is not what the post is about, because this blog’s main audience seems to like reading more about tennis racquets than tennis in general. Being a self-proclaimed racquetholic and a marketing guy, I’m always curious about the latest racquets and finding out what the top players play. You’d be surprised how often they use something completely different from what their sponsors advertise. This is also the case with Nick Kyrgios. He endorses the Yonex DR 98 , a well-reviewed model stemming from the previous Ai and Xi racquets (Yonex make good racquets, but less good names for them). But tennis pros don’t change racquet every other year, so what he really plays with is the Yonex Xi 98 . How does the Yonex Xi differ from the Ai or DR 98? You can read the TW review and find out, but I can already tell you it’s a stiffer and less nuanced experience than both the Ai and the DR 98. What Yonex did with the well-reviewed Ai 98 was that they changed the feel completely and created a more responsive, more flexible racquet that still had decent stability. But no matter if the Xi, DR or Ai is the better of the bunch, when a pro starts playing and liking a racquet, they’re very unlikely to switch. There are only a few players that seem to change their racquets from time to time. One of them is Fernando Verdasco, who seems to try a new setup every year, but if you look at for example Andy Murray he’s used the same racquet throughout most of his pro career (PT57A in 16×19 string pattern) and I would say that’s the far more common scenario. One of Kyrgios’s used racquets was recently on sale on Stringforum, the racquetholic website number one, for a whopping 3000 USD! It has a leather grip (I would guess some silicone in the handle), weighs 343 grams and has lead under the bumper at 10 and 2 o’clock. What strings does he use? Some think it’s a painted Luxilon ALU power , others the Yonex Poly Tour Pro . Will you play better with a pro stick like Nick’s? Sorry, but I doubt it. Pro sticks are usually ex-retail models with silicone in the handle and some lead under the bumper. Stuff you can add to your own frames without much hassle and money wasted. And if you do play better with a pro stock racquet, it’s probably for some purely mental reason making you able to summon the spirit of the player through your racquet (and good luck with that you nutcase!). Does it make sense to find a racquet you’re comfortable with and then customize it to perfection? Yes! Playing with a racquet that feels like an extension of your arm is a great feeling and makes you trust your game and not worry about the equipment. Nick Kyrgios doesn’t worry about equipment, but then again, he has other things to think about. Tags: Kyrgios actual racquetKyrgios DR 98Kyrgios racketKyrgios racquetkyrgios setupKyrgios tennis racquetKyrgios tennis racquet specskyrgios xi 98kyrgios yonex dr 98Kyrgios Yonex XiNick Kyrgios ATP fineNick Kyrgios racquetWhat racquet does Kyrgios use? 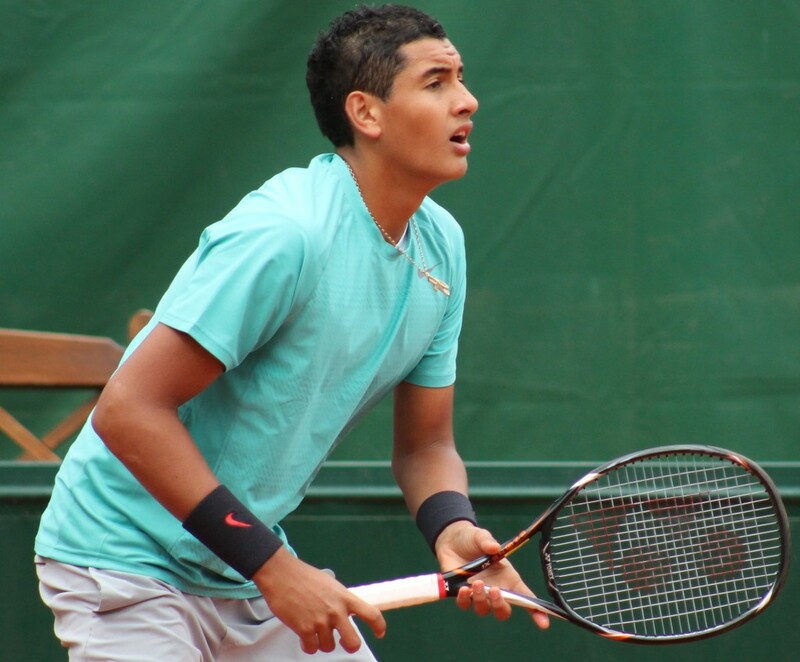 Bad Boy Kyrgios = Next Generation Federer? It’s not the vcore xi 98 (20 crosses) but the ezone xi 98 right? Thanks for the feedback. Yes, it is the Yonex Ezone Xi 98. A Nyck Kyrgios racket weighs 343 grams Strung weight plus anti-vibration plus overgrip? Yes, that weight should be a “court-ready” racquet.